Well ok not completely free but it is freeish, as long as you dont mind a bit of a wait. Given that you probably still have elderflowers somewhere near you I recommend you get out and pick them now and youll have your freeish booze in 2 weeks! I saw the first elderflowers in bloom two weeks ago and was so excited that I immediately grabbed some and brought them home. Then they sat in my kitchen for 2 days and promptly went quite smelly. The secret to elderflower cordial or champagne is fresh, just off the tree, in bloom elderflower. I have read that they freeze well so if you see some and dont think that you can do this today then that might be an idea. If you dont live in the country you're still ok, you can find these almost everywhere on the sides of roads, in parks and loads of other places but youre probably better off looking for slightly less polluted ones than half way along the m50. Also dont blame me if you get into trouble for picking them, much as the booze was my idea the idea to steal them from your next door neighbours back garden was not*. Ive seen a lot of different recipes for Elderflower champagne but went for the first I found on google by the fantastic Hugh Fearnley-Whittingstall which is available here. Get your big container and clean it. Pour the hot water into your container and then mix in the sugar until dissolved. After 3-4 days check to see if there are any bubbles/froth or any sign of fermentation. If not add your pinch of yeast. Mine didnt froth until adding the yeast but after that it sounded a little like rice krispies in milk. Grab a colander and line with muslin and put it over a large pot. Pour the mixture through the muslin. Pour into your glass bottles and seal. Leave bottles somewhere cool for a week before opening and drinking. Apparently its not uncommon for bottles to pop under the pressure so I would recommend leaving them in the bucket you used for fermenting just in case! I havent tasted the finished product just yet but wanted to put this up to inspire some people to get out and pick elderflower while they still can. I'll post a quick update on Sunday! Remember kids, always drink responsibly. * mine were stolen by putting my hand through the fence of my local primary school, the caretaker who passed by as my co-conspirator and I were there with scissors didnt say a word. As I didnt want to get rained on at Taste of Dublin this year, I left it until the very last minute to get tickets. So late that the session I wanted to go to was sold out. After trawling the interwebs for tickets I gave up in favour of trying to book dinner somewhere fancy instead. The first place I tried was Conrad Gallagher's newish place Salon des Saveurs and was more than a little surprised when there was a table available. This is not your random last minute Saturday night out place for dinner. Its probably more like something you plan a month ahead and I suspect if half of Dublin hadnt been in Iveagh gardens there wouldnt have been a hope of getting a table. 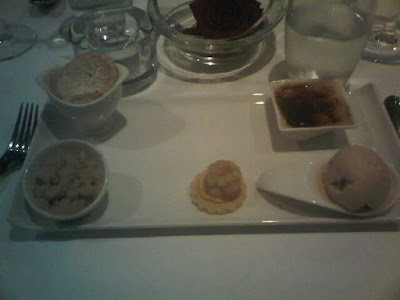 I had read the reviews but had only spoken to one person who had been there so wasnt really sure what to expect. So along we went. There are two sittings on a Saturday night - 7 until 9 and then from 9 on, so everyone was arriving pretty much the same time as us. Everyone gets their menus and then choses which of the 5 menus to go for and then whether they want to pair the wine or just buy a glass/bottle to go along with it. Menu 1 (€26 - amazingly good value) also has a €26 wine selection to go with it. Each person at the table must eat the same menu which I could imagine being difficult if you are there as a group of 6 (like the bunch of ladies at a table near us) or if you're like me and want to make sure the person with you can share some of their food! This was probably my least favourite of the 5 dishes as I felt that there were far too many tastes on the plate and maybe a little too little salmon to mix them with. The salmon came with 4 little piles of pear, radish, ginger and wasabi. The soy that I read from the menu now was poured on by the waiter which I felt was a bit of a pity as I would much have preferred the salmon without the soy. This next course was fab, perfectly cooked buttery risotto with a nice spicy chorizo, tender calamari and crunch soya beans. Looking around at this point we received the biggest of main courses and definitely had a few people looking jealously on as we devoured the beef. The beef, such tender melt in your mouth beef that I could almost compose a song for it (really, although I doubt you would want me to sing it for you). I barely tasted the rest of this course such was the amazingness of the beef. This was definitely the best value meal Ive had this year in Dublin as the two of us were fed, watered and had a glass of wine each for €74 before tip (although including a service charge they throw on). Annoyingly they dont take cards (of any kind) just cash and cheque (who has a chequebook any more?) so bring plenty of cash if you go as its a good walk to the nearest bank machine. The sommelier was charming, but our waiter a little forgetful and wasnt too good with wines (he told us that Macon Village was a type of grape) but still very good all the same. Will I be back? Without a doubt although with small groups only as I can only imagine the arguments that might brew over chosing the menu otherwise. A few weeks ago I was contacted by a PR agency asking would I be interested in interviewing Levi Roots. My first thought was that they obviously think Im someone other than the writer of this food blog, maybe someone who makes their living out of this rather than just typing away to myself here. 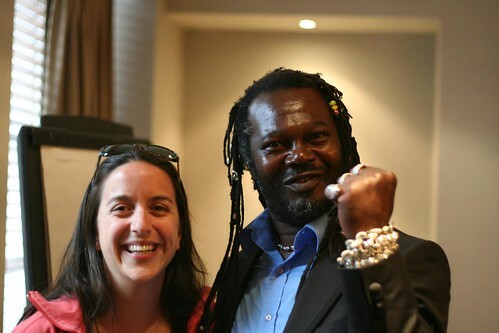 My second thought was that they were going to use me to spread the cultish word of Levi Roots, which I suspect is a lot easier to do by asking bloggers than to get a national newspaper to do the job. My third thought was that it didnt matter a hoot why they were asking and I didnt even have to publish anything if I didnt want to but that it was a good chance to talk to an entrepreneur in the food business who might be able to give me some of the secrets to his success and that if I was lucky I might just get him to sing to me or ask what shampoo he uses on those dreadlocks of his. I suspect that ready meals arent really his thing given his love for cooking but he seems to have this desire to spread the word on Caribbean food and to be fair the ingredients on his packets are not as crazily processed as some packaged foods would be. His Reggae Reggae sauce is now second in the UK only to Heinz Ketchup with companies like Wetherspoons and Subway using it. One of his favourite things in the world is still to cook food at home after wandering around to buy the ingredients and eat home cooked food, the other being his music which he realises he has had to tone down for his new sauce enjoying followers. He did admit that he had never eaten home cooked food in Ireland yet but declined the offer for some leftover rhubarb tart I had at home. He has had a fairly colourful life so far but is determined to make things right for his kids, two of whom run a restaurant that he set up and provide school meals from there every day. Knowing where he comes from and the fact that he has had to work hard is evident when speaking to him and he speaks to kids in schools regularly about how he started his business, many of whom will no doubt look to him as a mentor in future. He explains to me that giving up the recipe for the sauce was tough, tough to hand over the baby he created with his family in his kitchen to a company but Im pretty sure that selling 50,000 bottles a week has soothed some of that pain. When asked about the struggle to get investment he explained that he's glad he didnt give up on his passion and focus. He could have renamed his sauce, taken the "Reggae Reggae" out of it (my suggestion was Mr. Roots' brown sauce) and not told Bank Managers that he would sell more than Heinz and got some decent funding far earlier. That was never the an option for him though and he has no regrets after working on it for years honing his sauce and his business plan. He sees this as key to starting a business, having passion and focus. He reckons that now is the ideal time to be focusing on starting a business, having plenty of time to get ideas and business plans together before banks start lending again. There are a lot of reasons I might be the wrong person to be reviewing microwave ready meal dinners given that I dont have a microwave, I try to avoid ingredients I cant find in my kitchen (none/few in most of the dishes) and if I do find something I like Im more likely to try and reproduce it than go out and buy them up from a supermarket fridge. I really didnt have much interest in the bag of foods I was given as I walked out of the room and expected not to write about them at all but given that they were actually not all that bad they deserve a quick review. Reggae Reggae Chicken with butternut squash rice (medium)- tasty although the butternut kind of dried and hardened in the oven. Puerto Rican stylee chicken rice with roast peppers (medium)- Ive never been to Puerto Rico so wouldnt really know Puerto Rican style food if it hit me in the head so I was surprised, apparently olives are a key ingredient. This was the only one of the 3 dishes that didnt have oven instructions on the back so not all that surprisingly the plastic container melted in the oven. Levi's Caribbean Hot chilli Beef with seasoned rice (hot) - this was by far my favourite, really tasty and nicely warm, the kind of dish that would be fantastic to have when youre starving and dying for something really tasty.